IFA, the electronic consumer convention which has invaded Berlin since last week, isn't just stock-full of devices, washing machines and Full HD TV's. Applications are also being presented there, but perhaps in a more subtle way. This was the case with the new version of Twitter for tablets which was leaked by one of the Samsung Galaxy Note 10.1 2014 Edition also presented during the 2013 Berlin IFA. Download the APK here. It often seems like applications which are great for smartphones often lose some of their parts when passed on to tablets. In fact, it seems they're often created by a different team of developers. This was the case for past Twitter apps. However the new version of Twitter for tablets is now much improved and is strongly reminiscent of the Apple iPad interface, despite being developed for Android. I've tried the new APK on the Google Nexus 7 (2013) which worked without problem. Upon opening it, you could see that the home page is divided into two. Also in Home and Mentions, the part to the right is intended for suggestions of who to follow. When taking a look at our tweets, we are now able to see all the comments that we have selected. In the personal account, in our case AndroidPIT, tweets were found on the left and on the right, the last shared images. Finally, if we post a tweet, a gallery can be directly accessed to the right where you can choose images to accompany the text. 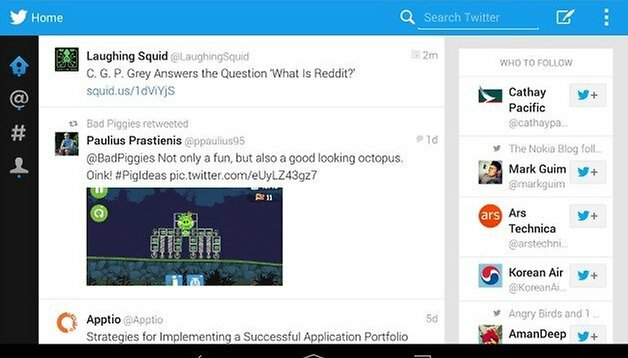 The people over at Next Android discovered the new version of Twitter for tablets and got the APK. You can download the APK here today, but it could be just a matter of days before the official roll out of the new version begins.